Now that the holiday has passed, I have some fresh perspective. The cards my kids collected at school were so simple and sweet. My boys loved receiving them and regarded each one as a valuable treasure. One of my favorites was a heart cut from discarded/used laser paper and colored on the backside. 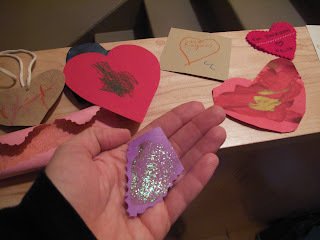 Another is a slice of construction paper with a smear of glitter. Yet another great one was a painted heart cut from a brown grocery bag with a string tied on to make it a necklace. The materials were simple, the effect was grand. Next year I will not fret about supplies and just grab some recycled papers and let the kids paint and glue on them. i really wish my kids school did this. I don't like all the candy they get.